The beetroot - quite literally the root of the beet plant - is normally associated with its luminous pink stain and earthy taste. Aside from these connotations, however, it is a versatile vegetable with plenty of lesser known varieties available in varying shades of reds, yellows and oranges. 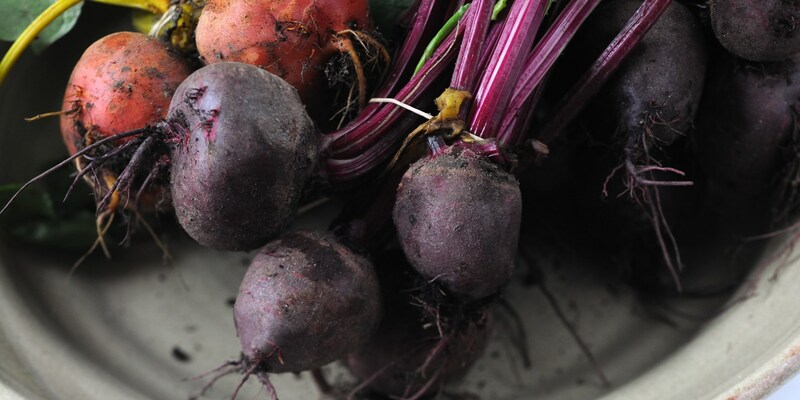 Often paired with fish, vibrant beetroot can be used to add colour and depth to many dishes. Anna Hansen’s Beetroot and liquorice cured salmon recipe makes a visually stunning meal, while Andy McLeish serves a chunky beetroot chutney with his Fish dogs, a twist on a street food favourite. Colin McGurran’s beautiful Pigeon with textures of beetroot recipe highlights many of the other ways to cook and prepare it, such as puréeing, pickling, smoking and dehydrating. Many chefs favour the sweetness of beetroot as a dessert ingredient, such as Christoffer Hruskova’s simple Beetroot sorbet recipe, to Agnar Sverrisson’s Chocolate parfait with beetroots and yoghurt ice cream.